1. Mix malai, cream, curd, capsicum, cucumber and onion in a bowl. 2. Mix the sweet corn kernels, salt, 5 chopped almonds, pepper powder and mint leaves in an another bowl. 3. Arrange the lettuce leaves on a plate. 4. Mix the cream and corn mixutre together. 5. Place them on top of the lettuce leaves. 6. Garnish with the remaining almonds. 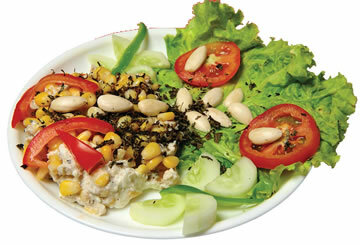 Feel free to comment or share your thoughts on this Almond and Corn Salad Recipe from Awesome Cuisine.